Q. What is carotid artery disease ? 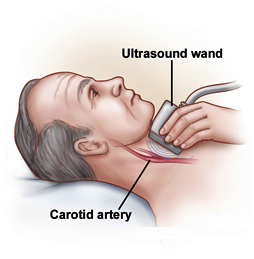 Carotid artery disease occurs when the major arteries in your neck become narrowed or blocked. These arteries, called the carotid arteries, supply your brain with blood. Your carotid arteries extend from your aorta in your chest to the brain inside your skull. You are more likely to develop carotid artery disease as you age. Only 1 percent of adults age 50 to 59 have significantly narrowed carotid arteries, but 10 percent of adults age 80 to 89 have this problem. Some plaque deposits are soft and are prone to cracking or forming roughened, irregular areas inside the artery. If this happens, your body will respond as if you were injured and flood the cracked and irregular areas with blood-clotting cells called platelets. A large blood clot may then form in your carotid artery or one of its branches. If the clot blocks the artery enough to slow or stop blood and oxygen flow to your brain, it could cause a stroke. More commonly, a piece of the plaque itself, or a clot, breaks off from the plaque deposit and travels through your bloodstream. This particle can then lodge in a smaller artery in your brain and cause a stroke by blocking the artery. Fortunately, you may be able to prevent or slow carotid artery disease. Quitting smoking is the most important change you can make to avoid this disease. Q. What are the symptoms ? Carotid artery disease may not cause symptoms in its early stages. Unfortunately, the first sign of carotid artery disease could be a stroke. However, you may experience warning symptoms of a stroke called transient ischemic attacks, or TIAs. Q. What causes carotid artery disease ? 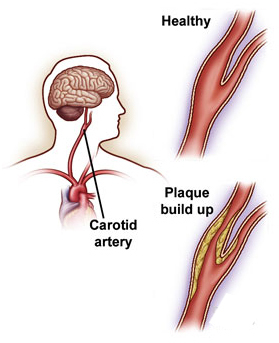 Hardening of the arteries causes most cases of carotid artery disease. Experts do not fully understand the cause of hardening of the arteries. Plaque may build up in the arteries because of an injury to the artery's inner lining. Factors that injure artery walls include smoking, high cholesterol, and high blood pressure. In rare cases, other conditions known as carotid aneurysm disease and fibromuscular dysplasia can also cause carotid artery disease. Q. What tests will I need ? CT scan and CT Angiography (CTA) : - CT and CTA scans take x-ray pictures in the form of slices of the brain and the arteries in your neck. CT scans can show an area of the brain that has poor blood flow. Your physician may inject a contrast dye to make blood vessels visible on the x-ray image. CTA shows the arteries in the neck and head and will identify areas of arterial narrowing. Magnetic resonance angiography (MRA) : - MRA uses radio waves and magnetic fields to create detailed images. Some forms of this test can show moving blood flow and may help evaluate carotid artery disease. To improve the test's accuracy, physicians sometimes inject a material, called gadolinium, to make the arteries more visible. Angiography : - In this test, your physician injects a contrast dye through a catheter that is threaded into your arteries and then takes x-ray pictures. The structure of your arteries appears on the x-ray images because x-rays themselves cannot pass through the dye. This test shows how blood flows through the arteries and whether they are narrowed. Angiography carries some risks, including a small incidence of stroke, which is one reason that physicians do not always use it as the first test to diagnose or follow carotid artery disease. Vascular surgeons also use angiography during carotid angioplasty and stenting, which is discussed later in this article. Q. How is carotid artery disease treated ? You may require surgery if your carotid artery disease is severe or has progressed. Signs of severe disease include having TIA symptoms, having experienced a stroke in the past, or just having a severely narrowed carotid artery even without symptoms. 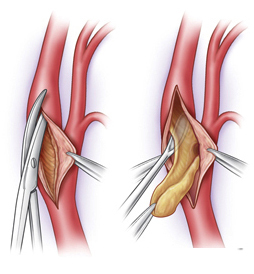 During surgery, your vascular surgeon removes the plaque that is blocking your carotid artery. The procedure is called carotid endarterectomy and can be performed using a local or general anesthetic, depending upon the particular situation. Once the anesthesia has taken affect, the vascular surgeon makes an incision in your neck and then removes the plaque contained in the inner lining of your carotid artery. This procedure removes the plaque and leaves a smooth, wide-open artery. You may even be able to leave the hospital as early as the same day or the day after the procedure, depending upon how you feel. This procedure is safe and long lasting when done by a qualified vascular surgeon in the proper circumstances. A newly developed minimally invasive procedure to treat carotid artery disease is angioplasty and stenting. Angioplasty and stenting is usually performed using a local anesthetic. To perform this procedure, your vascular surgeon may insert a long, thin tube called a catheter through a small puncture site over a groin artery and guide it through your blood vessels to your carotid artery. 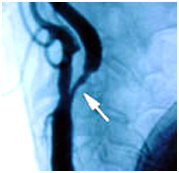 He or she then performs an x ray picture, called an angiogram, by injecting contrast dye through the catheter to show the location and details of the obstructing carotid plaque. The surgeon then inserts another catheter that carries a tiny balloon that inflates and deflates, flattening the plaque against the walls of the artery. Next, the physician places a tiny metal-mesh tube called a stent in the artery to hold it open. Your hospital stay after angioplasty and stenting is approximately the same as with endarterectomy. Carotid angioplasty and stenting is currently controversial because conclusive, long-term results are not yet available. Nevertheless, for patients who have medical conditions that increase the risk of carotid endarterectomy, angioplasty and stenting may be a good alternative. It has been approved for patients considered to be at high risk for the surgical endarterectomy procedure, or for patients who have agreed to participate in ongoing clinical studies designed to determine its effectiveness. Q. What can I do to stay healthy ?